February, other than being one of the most commonly misspelled words in the English language (I mean, if I had a dollar for every time…), is a month that is no stranger to weather extremes. Even though our littlest month has fewer days to work with, some of our most extreme weather can occur during this time. So then, how did 2017’s version of February fare for extremes? Let’s find out! An hour outside of Indianapolis is Muncie, IN – and this February was one for the record books in the mid-sized Indiana town. At an impressive 13.3 degrees Fahrenheit above average, Muncie had its warmest February on record. During the month, Muncie had just three days with at-or-below average temperatures. For the rest: 16 were at least 10 degrees above average and 10 were at least 20 degrees above average. Their warmest high temperature of the month was a balmy 73 degrees – a temperature more common three months ahead in May! Seven individual daily high temperature records were broken. 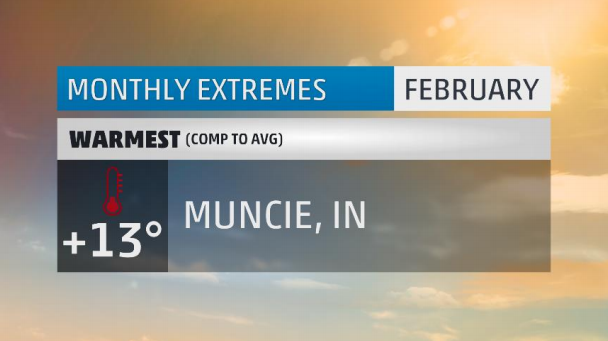 Not only was this Muncie’s warmest February on record, but it capped off what would be their warmest winter on record as well. We find our coldest spot of the month where we would expect to find it given the overall weather pattern. Moses Lake, Washington, which sits on the coast-to-coast stretch of Interstate 90 that connects Seattle to Boston, was below average every single day of the month. Of those days, six daily low temperatures were broken. If that seems a little lacking, you’re not wrong. 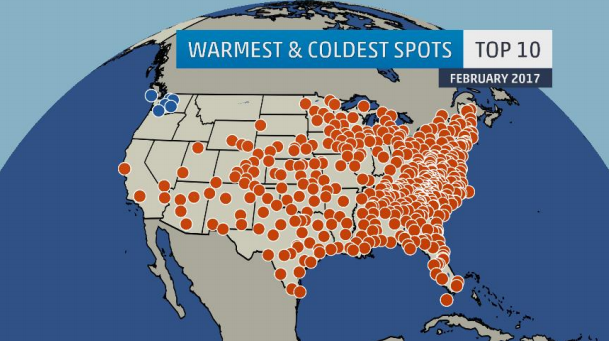 Cold was incredibly hard to come by in February, even for the places that had below average temperatures. Cities bordering the Pacific Ocean can get cold, but are often modified by streams of mild Pacific air. For our chilliest spot in the nation to only be nine degrees below average goes to show that, as a whole, the US was baking in February. If you’re a regular of this column, our find for wettest spot of the month may look a bit familiar. 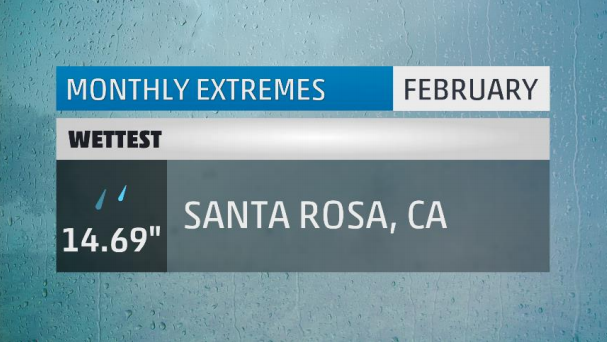 Santa Rosa, CA was not only the wettest city in the US in February, but in January as well! The city saw rain on 21 of the 28 days of the month, and made for its wettest February on record. Much of Santa Rosa’s rain fell in two lengthy batches. The first coming between the 2nd and 11th where close to ten inches fell without a dry day in between. The second fell between the 16th and 22nd when another five and a half inches fell without a dry day in between. The rain was not just a January and February record, but also a winter record. With just over 40 inches of rain, Santa Rosa had its wettest winter on record. As for a silver lining, even amidst all the rain, they still managed to see 10 mostly sunny days. Wet weather of all kinds was most prominent this month in the west. 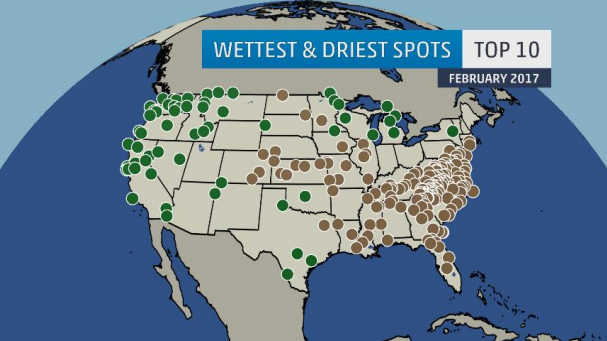 All of the green dots on this map represent places that had one of their top 10 wettest Februaries on record. Of note, both Pocatello and Portland had their wettest February on record. As for California’s drought situation, only 4% of the state remains in the severe drought category. Both the exceptional and extreme categories, which had covered much of the state for the past few years, have been completely erased. 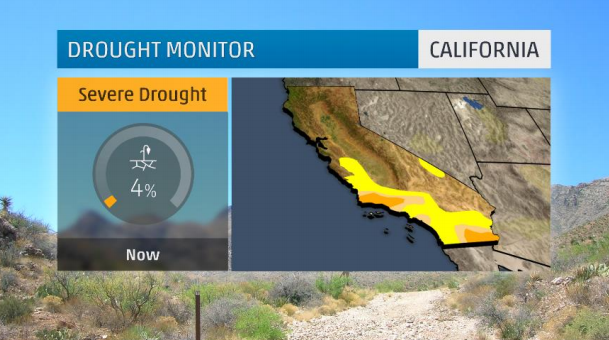 The end of California’s drought is very well in reach. New England was one of the few places where appreciable amounts of snow fell during the month of February. For those in Gray, ME, 44.6” was enough to notch them into the top spot this month. In what was a relentless start to the month, three back-to-back-to-back storms each dropped a foot or more of snow in the first 17 days. Each separate thump of snow was followed up by just one day without a flake of snow. For Gray, it was their 3rd snowiest February on record and their second snowiest winter season. Nestled in the center of the Texas Panhandle is the town of Borger. 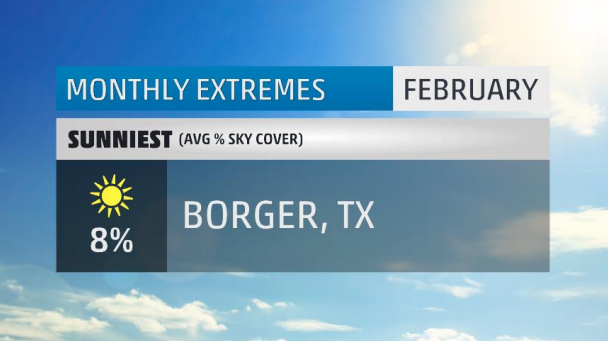 Known meteorologically as being the Texas record holder for seasonal snowfall at just shy of 60” (1982-83 season), this month turned Borger into the sunglasses capital of the US. The town registered 22 days in February without a cloud in the sky. Just two days featured precipitation making for its 8th driest February on record. Even a trace of snow managed to show up on Valentine’s Day! The oddity in all of this is that February, March, and April tend to be the cloudiest months of the year. Take that, climatology! I bet if you had to guess where our cloudiest spot was this month, you’d be pretty darn close on the first try. The wet weather along the west coast also meant the sun took a hike for a while. Such was the case this month in Eureka, CA. Nineteen of February’s twenty-eight days were completely overcast, and rain fell on all but three days. 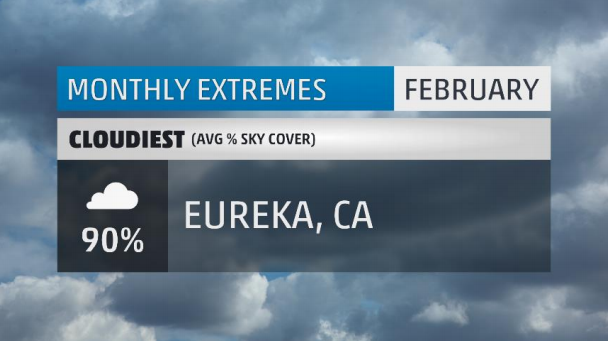 Eureka averages just 170 or so mostly sunny days per year, putting it well below the US average of 210. While February was awfully dreary, March tends to be their cloudiest month of the season. 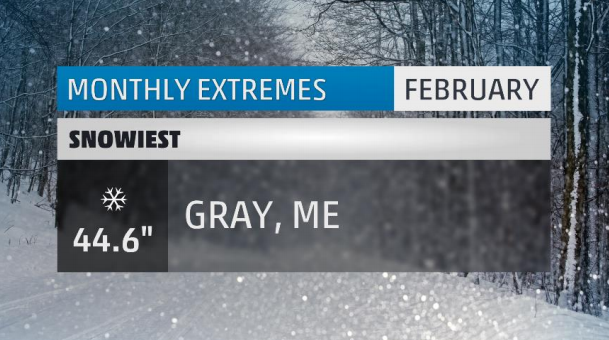 There you have it, the extremes for the month that was February 2017. Make sure to check back next month to see whether March comes and goes like a lion or a lamb. 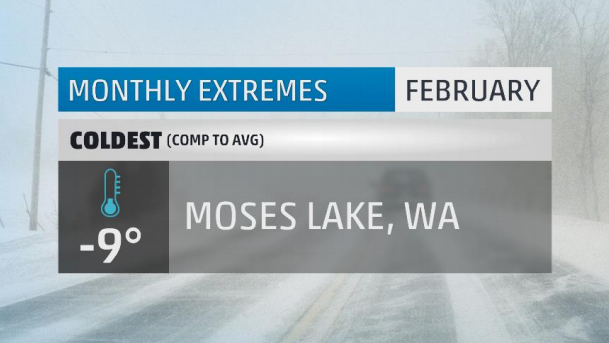 What weather extremes did you face in February? Let me know in the comments below. Ummm…. where I live, we had 75 degrees Farenheight….